A few months ago I was contacted by Renee Harris, the owner of Made On: Skin Care Products. Her flagship product is Hard Lotion, a moisturizer that comes in a solid bar instead of a liquid. At first blush, I dismissed the idea of working together — simply because lotions and lip balm aren’t food. Upon further consideration, I realized that there are indeed a couple of important connections between her products and what I write about here. What you put on your body can end up in your body (though more accurately, your skin actually is a part of your body). Our skin is absorptive, of course, so when you slather on that moisturizing lotion, well, it stays with you. I’ve long been a fan of the Environmental Working Group’s Skin Deep Cosmetics Database and the terrific work they’re doing to help educate consumers about the specific ingredients in each product. Because of them, I keep far away from oxybenzone (in most sunscreens) and try to limit my exposure to parabens (in almost everything). So, let’s get back to Hard Lotion. 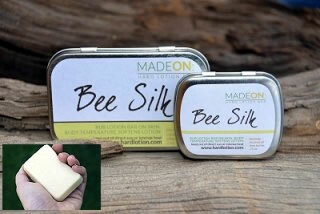 The bars and lip balm are made with just three ingredients: Shea butter, coconut oil, and beeswax. (Michael Pollan would be proud.) All of them score a “zero” in the cosmetics database (the best possible score). From an ingredient perspective, I’m totally sold. But how well do they work? Over the new year’s holiday, we were up in the mountains for about a week. It’s really dry up there, and I always struggle with dry hands and chapped lips when we’re there. This year, I brought up a Hard Lotion Beesilk bar and lip balm. They both worked fabulously to keep me from drying out. I’ll even go so far as to say that the lip balm is the best I’ve ever used. Really. It kept my lips from being chapped without making me feel like I needed to keep reapplying, and without making them feel greasy. Renee also wisely pointed out to me that cooks and chefs have to do a lot of dishes — and our hands dry out from all that work! The hard lotion bars are definitely a help — and you won’t have to worry about the burn of lemon juice on dry skin, or any toxic lotion rubbing off your hands and getting into your food. Renee has generously offered up a few gift packs for me to give away. So there will be two winners of a Hard Lotion 3-Pack Gift Pack (a family-size Hard Lotion bar, a pocket-size bar, and a lip balm). 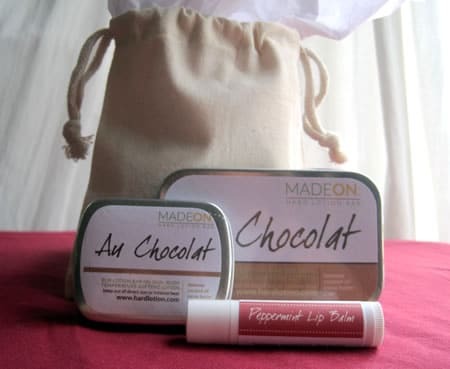 A third winner will get a 2-Pack Gift Pack (a Hard Lotion pocket-size bar and a lip balm). Winners can choose the original “Beesilk” or the Au Chocolate — which uses cocoa butter instead of shea butter. Like my other recent giveaways, I’m using Rafflecopter to take care of the details. Just follow the instructions in the widget below to enter (you’ll need to leave a comment as your first entry, and then you can enter again by following the other steps). RSS and email Readers, please click through to the post on eatingrules.com to see the widget. Disclosure: Before agreeing to work together, Renee sent me some free samples of her products. I have been using them for several months and truly like them and am happy to endorse them. As of this writing, Hard Lotion is an advertiser on Eating Rules, and I offered to do this review post and giveaway as part of our agreement. That stuff sounds awesome! I’ve been looking for something like this. Just discovered I am intolerant of almost everything, which means a revamp of all of my cosmetics, too. This would be a great start! Would love to try this, always looking for more natural products to use. Great giveaway! I would love to try these products. Sounds like a great giveaway! I was about to make my own lotion for my extremely sensitive teen, who now uses straight jojoba oil, but maybe I’ll wait and see if I win. And the thought of an effective lip balm is very appealing.